Keeping more comfortable and lowering your home energy bills is a lot like caring for your car. Just like a car, your home’s air conditioning system needs routine annual maintenance to keep operating efficiently. Plus, an annual CJS Heating & Air Conditioning System Precision Tune-up prolongs the life of your system. When your air conditioner and furnace run efficiently they don’t have to run as long to do the job, saving you money. And, when equipment doesn’t have to work harder, they lasts longer. Three good reasons to schedule your CJS Precision Tune-up today. Air conditioning tune-ups help your system run at or near original factory specifications, depending on its age and overall condition. Need more convincing? Caught in time, a simple refrigerant leak can be repaired easily and affordably. However, a leak left undetected can drain the refrigerant and burn up the compressor. A compressor can cost $1,700 or more to replace. What’s worse, before the compressor fails, it will run inefficiently, resulting in hundreds of dollars more on your electric bills. A CJS clean, screened, trained and timely tech checks your system to make sure that it is running as efficiently as possible. That’s done by checking refrigerant levels, amp draws, etc. We also inspect critical components (capacitors, motors, contractors, etc.) to insure system reliability, and check your duct system to make sure your system isn’t excessively losing air. We make sure your system is running at peak condition so you don’t have to worry about it breaking down in bad weather or costing you more on your energy bill than necessary. Scheduling routine annual air conditioning tune-ups helps save money and headaches. That’s so much better than waiting for your AC to suddenly stop working properly. Don’t make this mistake this year. 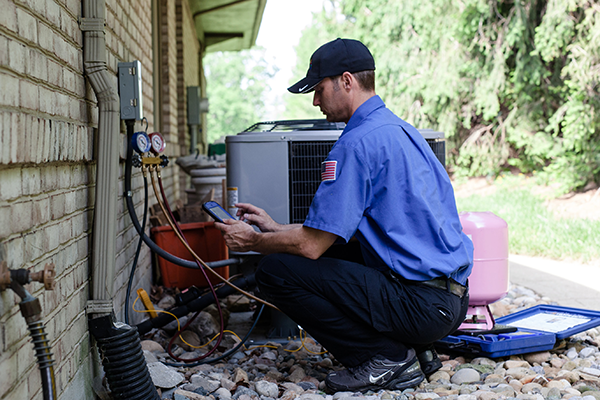 Schedule your CJS Precision AC Tune-Up today. If you prefer to speak with someone, or this is an emergency, give us a call at (937) 488-4059.